Detail from Sacrament, by Minerva Teichert (ca. 1935). On display in the JSB at BYU. Last night at the Third Nephi conference held at BYU, Professor John W. Welch gave the keynote address. His topic was “New Insights Into the Temple Setting of the Sermon on the Mount in Reference to the Sermon at the Temple.” It was an excellent address, after which Paul Y. Hoskisson, the director of the Laura F. Willes Center for Book of Mormon Studies, remarked that he was overwhelmed by what he just heard. You can read my notes on the conference last night here. 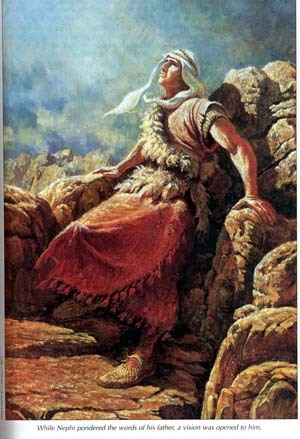 Part 2 of liveblogging the Third Nephi Conference at BYU. This is a liveblog of the conference entitled “Third Nephi: New Perspectives on an Incomparable Scripture,” which is taking place at Brigham Young University on September 26-27, 2008, from 6:30pm on the 26th to about noon on the 27th. See my previous post on the subject, or the program of the conference here. Note: Those reading this in an RSS feed or an email will have to visit TempleStudy.com to see the liveblog feed below. Press the play button below to load the liveblog. In the liveblog window, you can participate live with me by entering your name, your question/comment, and clicking on send. Enjoy!